The Overwhelming Choice of Racers! K-Motion Valve Springs deliver the high quality and superior dependability required to meet their performance requirements. K-Motion starts with the highest quality wire available. All alloys used are manufactured and inspected to the highest industry standards. Quality wire is the first essential step in manufacturing springs designed for extreme, high, aggressive cam lifts and ramp speeds. Metallurgists measure a material's resistance to failure with fracture toughness. This, combined with the material's strength, determines whether or not a material is a suitable choice for a specific application. This is why K-Motion Valve Springs utilize four different alloys. For each application, only the proper material is selected. After coiling, springs receive a variety of carefully controlled heat treatment and surface finishing processes. The intent is to reduce load loss and increase spring life. Each spring is visually inspected for surface imperfections, which could lead to early breakage, and dampers are radius ground and depointed for longer spring life. Each valve spring assembly is cold pressed with as much as 2500 pounds of pressure, based on application. A pink stripe is added for identification, and then each spring is individually pressure checked & boxed with no more than 5 pounds variation per box. From design to manufacturing to load matching spring sets, every effort is made to provide the very best valve springs. Does K-Motion K-700 fit your vehicle? 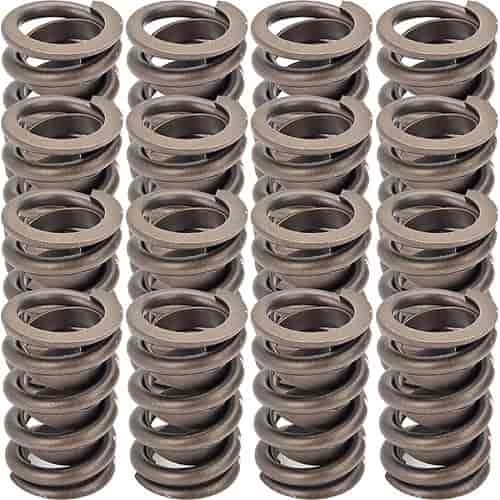 K-700 - K-Motion Premium Valve Springs is rated 5.0 out of 5 by 1. Rated 5 out of 5 by gorilla tight from high lift cam, these are great. I have already told several people about the springs and told them if they need specialty items that Jegs is the place to go. Thank You. glenn w.